Siesta Key has more than six glorious miles of beaches. That's plenty of room for variety, and that's exactly what you'll find on the keys. 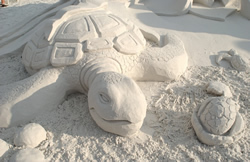 Siesta Key Public Beach is your gateway to the award-winning internationally famous pure white quartz sand beaches of northern and central Siesta Key. 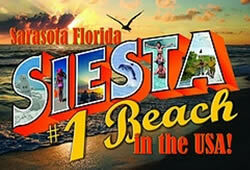 Check out the Siesta Key Public Beach Web Cam. The full-service beach facilities and free parking provide everything you'll need for a day on one of Florida's most unforgettable public beaches. And don't think you have to confine yourself to the designated public beach area where most of the beach crowd hangs out. Feel free to walk as far north or south on the beach as your feet can take you. If that's not enough to convince you, here are four reasons you'll absolutely love Sarasota Siesta Key Public Beach. Siesta Key Crescent Beach is a 1.5 mile long crescent of pure white sand beginning at the southern edge of Siesta Public Beach and stretching all the way south to Point-of-Rocks. This is where you'll find a huge selection of beachfront resorts and vacation condominiums overlooking the placid Gulf of Mexico. And, there's a surprise waiting for you at the southern end of Crescent Beach: Point-of-Rocks offers one of the best shallow water snorkeling opportunities on Florida's southwest Gulf coast. Find out what's so special about Siesta Key's Crescent Beach and Point-of-Rocks. Turtle Beach, Siesta Key is a public beach access south of the Point-of-Rocks neighborhood. This is where the sand makes a dramatic change from pure white to a luxurious fossil-filled gray. Millions of tiny bits of polished fossilized material mix with the white quartz creating a different quality and texture along with the opportunity to find a few shark's teeth if you look closely. And that's not all! Longboat Key is an island about four miles north of Siesta Key, roughly 20 minutes away from Siesta Key by car. The island has nearly ten miles of white sand beaches watched over by tall gated condominiums. Nearly as common as bathing suits are golf and tennis attire. And, the island has adopted Sarasota's enthusiasm for fine dining. Find and enjoy the "hidden" beach access points on Longboat Key's exclusive beaches. Beer Can Island is not the kind of name you might expect to be attached to a Longboat Key beach, but this quiet, wooded hooked spit on the north end of the island is as different in character from the rest of the island as its name would indicate. But don't worry, it isn't strewn with beer cans and doesn't attract an uncouth crowd. It is littered with sea shells and shorebirds and is one of the most scenic, quiet and relaxing beaches in Florida. Lido Key is a small island immediately to the north of Siesta Key. It is loosely integrated with downtown Sarasota where going to the beach and going shopping are often combined activities. Once you cross the bridge from downtown Sarasota onto Lido Key, you know you are someplace special. Despite the plentiful and popular shopping boutiques, fine restaurants and art galleries, the beach holds its own as the focal point of the Lido Key experience. With three excellent public access points, Lido Key offers something for everyone. North Lido Beach is a short walk from the relaxed commercial hub of Saint Armand's Circle. What it lacks in public facilities it more than makes up for in peace and quiet. Just a short walk north on the beach toward New Pass takes you to an undeveloped white sand beach used by people who prefer a quieter beach experience and a closer connection with nature. Lido Public Beach is the main public beach access on the key. Located about mid-island, it has everything you'd expect from a top-notch public beach, plus a swimming pool! 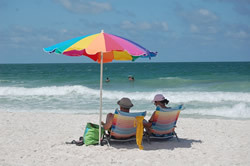 Beach parking is free and you can walk north or south as far as you like on the beach and explore the more than three miles of pure white sand beaches on Lido Key near downtown Sarasota. South Lido Beach Park is perfect for nature lovers and for a family picnic. It overlooks Big Pass, the inlet between Lido Key and northern Siesta Key. What a view! Acres of shady Australian pines provide shade for picnic tables and for the playground equipment. Arrange for a kayak tour through the shady mangrove tunnels or just relax on a huge white sand beach overlooking the Gulf of Mexico and Big Pass. Nokomis Beach and North Jetty Park are the only two public accesses on Casey Key, which is a barrier island south of Siesta Key's Turtle Beach. Casey Key is physically connected to Siesta Key since the Midnight Pass inlet was filled in with sand years ago, but there is no road connecting the two islands so you'll have to access Casey Key from the mainland. The key has over five miles of mostly private beaches with no high-rise condominiums or large resorts. A favorite way to arrive on Casey Key is via Blackburn Point Road, which takes you across a one-lane bridge right by the old Casey Key Fish House Restaurant. Drive south along the scenic Casey Key Road to either Nokomis Beach, or to North Jetty Park. Both are well-equipped public accesses. If you like to fish, North Jetty Park is the place. Venice is a small coastal city modeled after its sister city in Italy. It's a 25 minute drive south of Siesta Key. With more than five miles of sandy beaches and one of Florida's best doggy beaches, Venice should be on your list of places to visit. Beach access is free and easy. Venice Public Beach is right at the west end of Venice Avenue, just half a mile from the heart of quaint downtown Venice. Arrive early and do free yoga on the beach with instructor Elin. If fishing is your thing, head north on The Esplanade and follow the signs to Humphris Park, also known as south jetty on the Venice Inlet. Get the important details on how to enjoy Venice Municipal Beach and south jetty park. Brohard Park Beaches are a series of excellent public beach access points on Harbor Drive South beginning about half-a-mile south of downtown Venice. They include Service Club Park, Brohard Park and the Venice Fishing Pier, Paw Park, Maxine Barritt Park, and South Brohard Park. There's enough beach here to keep you busy for a long while. Caspersen Beach Park is at the very southern end of Harbor Drive. 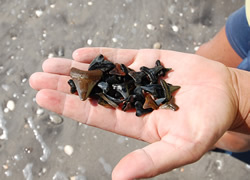 An amazing beach boardwalk, state-of-the-art environmentally friendly restroom facilities, free parking, lots of rocks on parts of the beach for fishing and snorkeling, and miles of undeveloped sandy beach with shells and shark's teeth are waiting for you. And there's more!